Ceramic tiles are one of the most popular ways of decorating the interior and exterior of a home. People have chosen different styles of ceramic tiles to add beauty and comfort to a home. Methods of installation have changed over time and the styles have become a lot more diverse. Ceramic tiles are the most practical installations where water is a risk factor, which includes kitchens, bathrooms, and basements. 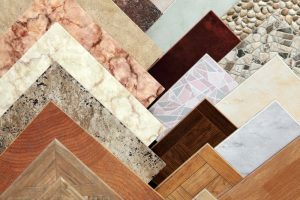 Consider options such as bathroom flooring, shower pans, tub and shower surrounds, kitchen flooring, back splash, and cement board under-laying. Find out more about ceramic tile design and how these tiles can fit your lifestyle. Ceramic tiles have been in use for many generations. Originated in Ancient Egypt, ceramics have been around for over 4,000 years. Tiles mainly consist of clay. Once they are shaped and dried, they are fired in a kiln at high temperatures: This process allows for the tiles to harden. Today ceramic tiles are very popular for interior and exterior usage and they also come in all shapes, sizes, colors, and glazes. In addition, modern technologies greatly expanded the options for shades, finishes, and shapes of all ceramic tiles. Because there are so many choices of ceramic tiles, it’s easy to find something that will fit the wants and needs of you and your home. It is nearly impossible to go wrong with beautiful ceramic tiles. Of course, it is all based on personal choice and how the tiles are installed. It is also very important that the job is done well. Keeping all that in mind, making the perfect tile choice depends on few of these basic concepts. Glazed ceramic tiles are very popular in kitchens, bathrooms, and laundry rooms. That is because glazed tiles are tougher and more scratch and chip resistant. 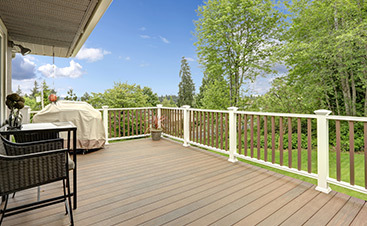 Unglazed tiles are not quite as stain resistant and do not have as much shine. However, they have the advantage of being less slippery. Ceramic tiles have a standard thickness up to ¾ of an inch. The thicker the tile, the stronger it is, making it less prone to cracking. Thick ceramic tiles should usually be used on the ground. Thinner tiles are more prone to breakage, therefore, they are typically used on walls. There a few basic types of ceramic tiles to choose from to suit any décor and area. These include sinter, terracotta, majolica, red biscuit, white biscuit, and mosaic. The all offer their own unique look to transform all types of living areas to make the look more luxurious. Styles depend a lot on the shape. Most ceramic tiles are used in shapes of squares and rectangles, but they also appear in triangles, circles, and other common shapes. The many benefits of ceramic tiles make them a timelessly popular option. Ceramic tiles have a high variety of dimension, color, style, shape, and texture. 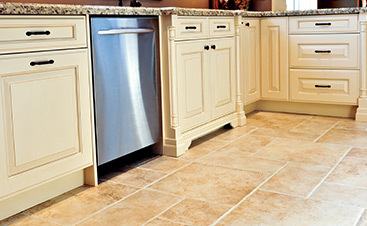 The tiles are firm and resistant to chemicals, fire, and water. Plus, they are environmentally friendly and do not retain bacteria or odors. An added benefit is the fact they are quite easy to clean and maintain. Ceramic tiles may be used in any room of the house, it simply all depends on personal preference and the structure of the home. The most useful places for ceramic tiles are kitchens, bathrooms, laundry rooms, basements, and patios simply because they are resistant to fire, do not harbor germs, and are very easy to clean. Ceramic tiles are not only for the floor, but can also be used for walls, countertops, and backsplashes. Wall ceramic tiles are also very popular in the kitchens and bathrooms since they are water resistant. Textures, styles, and colors can be easily matched to anything else within the room to make it look fashionable. Cleaning ceramic tiles isn’t as hard as it seems. It is just very important to follow simple rules to whatever type of tile you have. Cleaning can be done to keep the files looking impressive for years to come. Make sure to avoid placing a heavy vacuum on the tiles as it can damage the surface. 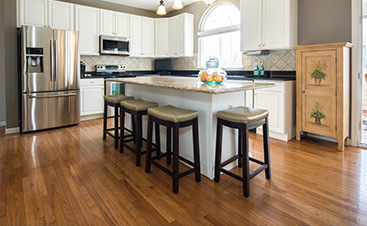 Clean up spills as fast as possible to avoid stained grout. Use water and a few drops of detergent to spot clean and rinse with clean water afterwards. For heavier soils, use manufacturer-recommended grout and tile cleaners. Use a sponge or a scrubber to clean older stains or spots. Make sure not to use too much water, ceramic tiles are usually cleaned with a damp mop or towel. Ceramic tiles are both beautiful and easy to maintain. Consult with a professional about the selection and installation of durable, attractive ceramic tiles to enhance your home.